Tektronix, Inc., the world's leading manufacturer of oscilloscopes, recently announced a series of new models, options and enhancements to its popular MSO/DPO4000B and MSO/DPO3000 mixed signal oscilloscope series, helping to address a broader range of embedded system test and debug needs at more aggressive price points. With the new models and enhancements to its bench oscilloscope family, Tektronix is making it possible for engineers to avoid compromising on performance and accuracy in order to stay within tight budget constraints. While embedded designs continue to grow in complexity, budget levels in many cases have stayed constant or gone down. With these introductions, Tektronix is adding more pricing and configuration flexibility to help engineers configure affordable test solutions to meet their needs. With high-speed buses like USB 2.0 and Ethernet now being implemented in mainstream embedded designs, faster, more capable oscilloscopes with at least 1 GHz bandwidth are becoming the norm. This in turn has created a need for more flexibility in terms of number of channels and record length at this level of performance. To meet this need, Tektronix is introducing six new MSO/DPO4000B oscilloscopes with 1 GHz performance. The company will offer two channel models with 20 Mpoint record lengths and two and four channel "lite" versions with 5 Mpoint record length. New "lite" or "L" models such as the DPO4102B-L drop the starting price for the series to under $10,000, with further flexibility across the full product range. "We are actively engaged with our customers and are focused on continually updating and expanding our product offerings to meet their changing needs. Some oscilloscope customers may not need more than two channels or record lengths of more than 5 Mpoints and at the same time face tight budget constraints," said Roy Siegel, general manager, Oscilloscopes, Tektronix. "Our new oscilloscope models don't compromise in key areas such as triggering, search and analysis, as well as having 1 GHz passive probes included - all this makes it much easier to move to the 1 GHz scope performance level without breaking the bank." All 1 GHz oscilloscopes in the MSO/DPO4000B series include one TPP1000 1 GHz passive probe per analog channel. This general-purpose probe features extremely low 3.9 pF capacitive loading for visibility into the high-frequency signal details found in USB 2.0 and Ethernet devices. In contrast, competitive 1 GHz oscilloscopes typically come with 500 MHz probes, requiring additional investment for testing higher-speed signals. Project requirements can change over time, creating a need for improved oscilloscope performance. With the addition of new bandwidth upgrade products for the MSO/DPO3000 series oscilloscopes, engineers can purchase the bandwidth they need now, and simply upgrade it (up to 500MHz) when project requirements change - without purchasing a whole new instrument. 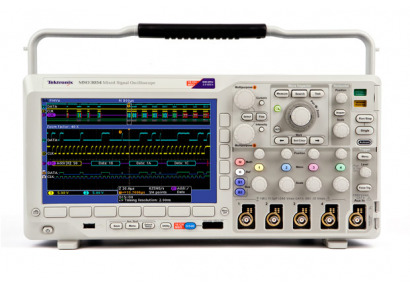 These oscilloscopes are ideal for general purpose debug, power analysis or serial and parallel bus analysis. In addition to bandwidth upgrades, the MSO/DPO3000 series oscilloscopes now offer comprehensive support for MIL-STD-1553 and FlexRay serial buses popular in the aerospace and automotive industries respectively. Both the DPO3AERO and DPO3FLEX modules enable triggering on packet-level information as well as analytical tools such as digital views of the signals, bus views, packet decoding, search tools, and packet decode tables with time-stamp information. Further broadening the range of serial bus support that includes I2C, SPI, CAN, LIN, RS232/422/485/UART and I2S/LJ/RJ/TDM. "Anticipating future requirements is never a simple task. By allowing customers to upgrade their oscilloscopes' bandwidth right on the bench with software and only a few keystrokes, we've made that task much easier," continued Siegel. "Now customers can simply buy enough bandwidth for the task at hand and add performance as needs change." Tektronix bench oscilloscopes deliver innovative features to help engineers complete debug and analysis jobs quickly and efficiently. These oscilloscopes are delivered with industry-best probes reducing total purchase price. They offer best-in-class usability with extensive triggers to identify elusive anomalies and comprehensive Wave Inspector tools to navigate waveforms and track down signal problems. The new 2-channel, 1 GHz MSO/DPO4000B oscilloscopes are available worldwide with a starting price of $9,990 US MSRP. The upgradeable MSO/DPO3000 models are also available now worldwide starting at $3,380 US MSRP. Wondering what else Tektronix is up to? Stay up to date on the latest news from Tektronix on Twitter and Facebook.